Master & Dynamic's MA770 wireless speaker is made of concrete | What Hi-Fi? 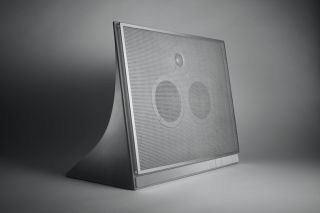 The Master & Dynamic MA770 wireless speaker was designed in collaboration with the architect behind the new Smithsonian museum in Washington – and it shows. Master & Dynamic's new wireless speaker is unlike any we've seen before. While some wireless models go for fresh features or bright colours to make a splash, the MA770 looks like a concrete slab of architectural wonder. Which is fitting, seeing as it was designed in collabroation with an internationally-renowned architect. Sir David Adjaye is the man in question. He also designed Washington D.C.'s new Smithsonian museum, the National Museum of African American History and Culture. Under his guidance, the MA770 is the first wireless speaker to be made from a proprietary concrete composite. Yes, M&D made its own concrete. Why? Because it looks really cool. Or, to use the words of Master & Dynamic's marketing department, "the piece has a rich, sculptural quality, with a robust, tactile heft that is delicately balanced with gentle, sculptural curves". That's what we said. But it's not just about looks. The heavyweight design aims to help the sound quality, too. Benefits include increased dampening (five times more than wood and 10 times better than plastic, it's claimed), reduced resonance (making for a purer sound) and increased durability. Just don't drop it on your foot. In fact, Master & Dynamic claims its dampening is so good that when placed just inches from a record player and played at full volume, the record won't skip. Onboard are dual 4in woven kevlar long-throw woofers, a 1.5in titanium tweeter, a 100W Class D amp and diamond-cut anodised-aluminium controls. The components are protected by a magnetically-attached stainless steel grille, which you can remove if you prefer. The speaker also has Chromecast built-in, so you can connect it wirelessly to your phone and beam tunes to it. The Master & Dynamic MA770 is available to pre-order now for £1,600 from the Master & Dynamic site or the MoMA Design Store.